Are you fed up with rhubarb recipes yet? 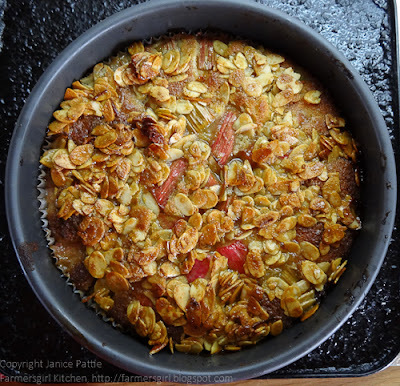 When I asked Twitter for suggestions of recipes using rhubarb, Vicky Saunders of Yum Yum Bubblegum replied to tell me about the Rhubarb and Orange Cake, the recipe for which she had snipped from Good Food Magazine some years ago. It sounded like just what I was looking for to create a cake which meets the requirements of this month's We Should Cocoa, the blog event created by Choclette at Chocolate Log Blog and Chele at Chocolate Teapot. As always, the recipe must contain chocolate and this month it is guest hosted by Shaheen at Alottment to Kitchen (A2K) who has chosen the star ingredient as 'Mango'. 1. Mix the rhubarb with 50g of the caster sugar and the orange zest, then set it aside for an hour, giving it a stir or two. 2. Cut the mango pieces into small bite sized chunks and cover with orange juice, leave to soak for at least an hour. 3. Pre-heat the oven to 190/gas 5 and grease and line a 23cm loose-bottomed cake tin. 4. Cream the butter and remaining 150g sugar until light and fluffy. Drain any remaining orange juice from the mango pieces and add to the butter and sugar with the eggs, baking powder, flour and ground almonds and beat gently until smooth. Stir in the chopped white chocolate. 5. Turn into the tin and level with a spoon. 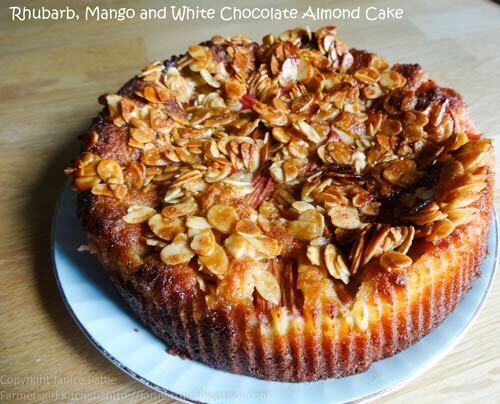 Spoon over the drained mango pieces, drain the rhubarb and spoon the chunks over the cake. 7. Meanwhile, make the topping by melting the butter and stirring in the sugar, zest and almonds. 8. Take the cake out of the oven, reduce the temperature to 180/gas 4, sprinkle the topping over it and quickly replace it in the oven for another 15-20 minutes until firm in the centre. 9. Cool in the tin for 20 minutes or so before transferring to a rack. Dust with icing sugar and serve warm or cool with thick cream. 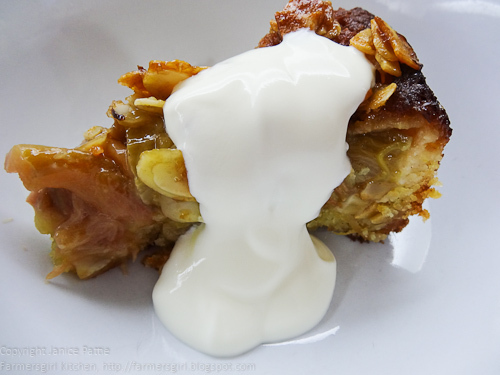 I was a little concerned that adding the mango as well as the rhubarb might make the mixture too wet, but it baked perfectly and, I have to say, the topping is genius! The almonds caramelise with the sugar and butter and provide a sweet and crunchy contrast to the moist almond sponge and sharp/sweet taste of the fruits. I served the cake slightly warm with Greek Yogurt, but it would be equally good with cream or icecream or served cold with a cup of tea or coffee. Many thanks to Vicky for passing on this fantastic cake recipe and to Shaheen for hosting this month. We have loads of rhubarb too but I am very excited as we only planted it last year at our new house so didn't harvest any last year to let it get established. Yum!!! This cake looks incredible... love the crunchy, caramelized topping! 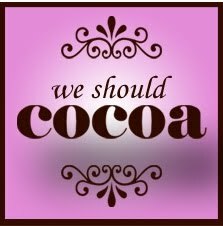 This is my first visit to your gorgeous blog and I have to say I'm subscribing now! Thanks for sharing the recipe. This sounds utterly gorgeous. I love the sound of all those flavours, and the caramelized topping sounds perfect! Thank you for your comments, more rhubarb recipes coming soon and all listed in The Rhubarb Collection tab at the top of the page. Welcome to laurasmess.me I hope you visit again. Ooh, that does sound fabulous Janice. I do like a good rhubarb cake. I would never have dreamt of pairing it with mango, sounds quite adventurous but also delicious. Our rhubarb is in a sad state and has never fared well down at our plot, we've tried three separate plants now. In our old plant we had loads of healthy rhubarb - very strange! Thank you for the name-check! This looks amazing.